MOSCOW, April 24. /ITAR-TASS/. Militants and armored vehicles of the Sloviansk self-defense units have been redeployed to the city’s downtown. Deputy commander said on a briefing that special services’ and army units are currently throwing a cordon around the city. Rossiya 24 TV channel reports that Sloviansk is almost completely blocked: it is possible to enter the city only from the east, from the side of Donetsk. 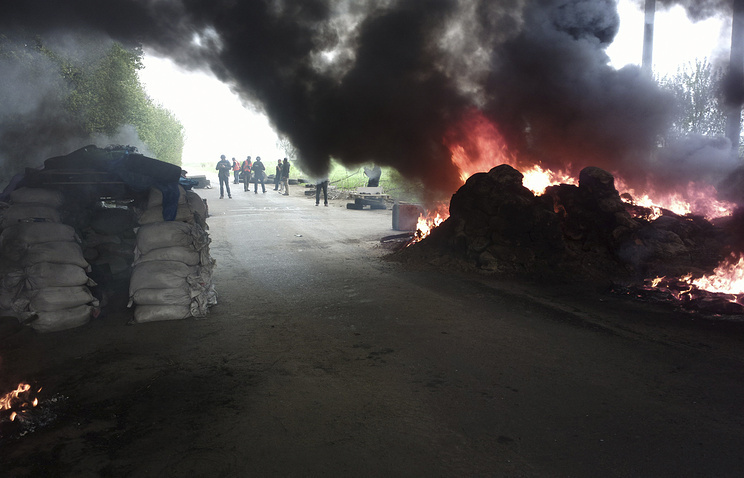 A self-defense forces’ representative said that the city’s defendants dropped back, leaving the checkpoints. “Our aim is not to hold them. The checkpoints are left in order to avoid unnecessary losses,” he said, noting that servicemen are entering the city in small groups instead of a wide frontage. Unarmed locals are urging the servicemen to refuse from participating in the special raid against supporters of Ukraine’s federalization. It was reported earlier that mobile communication with Sloviansk was breached. It has been also reported that the military raid was suspended. At the same time, there are reports that field engineers were checking the route of further passing of armored vehicles. 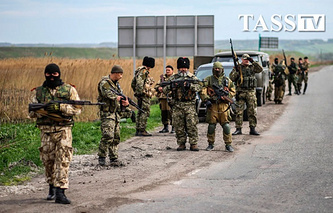 In addition, an ITAR-TASS correspondent has reported from the site, that Ukrainian army servicemen came forward in the morning towards a checkpoint in Sloviansk located near the Kombikorm factory. They have destroyed a part of the fortifications, took food reserves, appliances and left in the opposite direction. On Thursday, soldiers of self-defense forces in Sloviansk together with a reinforcing from Krasnyi Lyman fought off the attack of Ukrainian servicemen that were taking part in the military action on the entrance to Sloviansk. “The armored column backed off. The militants got reinforcing from Krasnyi Lyman. Volunteers, even unarmed, continue arriving at the strategic point,” local media reported. Russia’s Defense Minister Sergei Shoigu reported that a group of Ukrainian troops numbering over 11,000 people completely armed with automatic weapons is taking part in a military operation against civilians in Ukraine’s southeast. About 160 tanks, more than 230 infantry combat vehicles and armored vehicles, at least 150 guns and mortar launchers, and a huge amount of aircraft are involved in the operation. “The situation in Ukraine causes serious concerns. Since April 22, the new Ukrainian leadership started the so-called active phase of the raid in the southeast parts of Ukraine. There are already victims reported,” the Russian defense minister said. He informed that “against civilians are units of the National Guard, as well as squadrons of extremists from the Right Sector (Kharkiv, Slabozhanets), the forming of the Donbass squadron has begun”. Servicemen from special task units of Ukraine’s Security Service and the Interior Ministry redeployed to Donetsk and Luhansk are suppressing the civilians’ protest.